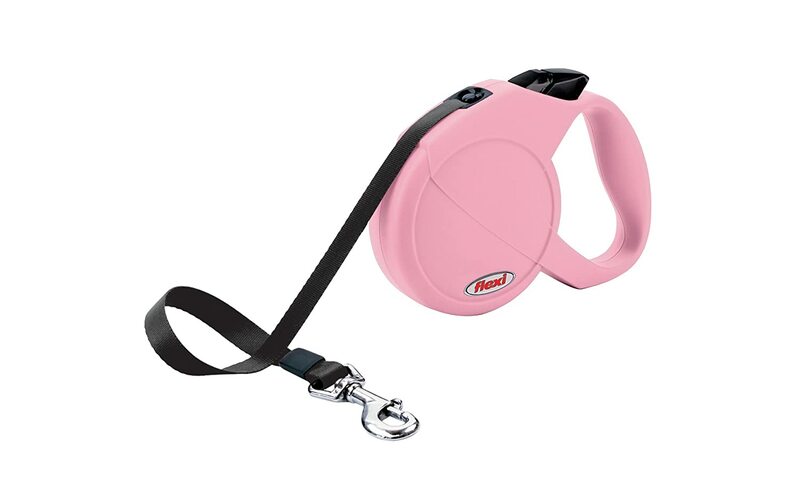 This Pink flexi Durabelt Retractable Dog Leash is for large and extra large dogs that weigh 150 pounds or less. This leash features a Black retractable belt that extends up to 16 feet. This leash is perfect for typical walking environments but the durable construction and all-belt design can handle even the toughest pullers. The flexi Durabelt is available in 4 sizes and 4 popular colors. Over the past 40 years, flexi retractable leashes have become a must-have item for pet owners around the world. flexi retractable leashes are known for their high-quality, superior durability and attractive design. The patented one-hand braking and recoil system allows you to maintain full control of your dog during your walks together. This innovative system is integrated into the leash's ergonomic handle so it's easy to adjust the leash to an appropriate length for your surroundings. The lock button allows the leash to stay at a constant length. All flexi retractable leashes come with a Safety Precautions & Directions pamphlet that describes how and when to use flexi retractable leashes properly. A safety collar is included with every package and it should be used while walking your dog on any flexi retractable leash. All flexi retractable leashes are proudly handmade in Germany and are covered by a Limited Manufacture Warranty. Please note that this warranty does not cover damage caused by dog chewing, rough surfaces or other misuse or abuse.